Hiring? Toptal handpicks top interim CFOs to suit your needs. Edwin has 20+ years of international finance experience across a range of industries, and over a decade of experience as a CFO. Organizational change is increasingly necessary, but implementing change is really hard. Due to the increasing pace of technological progress, the time between innovation and adoption has shortened tremendously, putting significant pressure on legacy businesses and in turn markedly shortening their average lifespans. But change is hard. Studies by HBR, McKinsey, BCG, and IBM all point to very low success rates for change management projects within corporations. 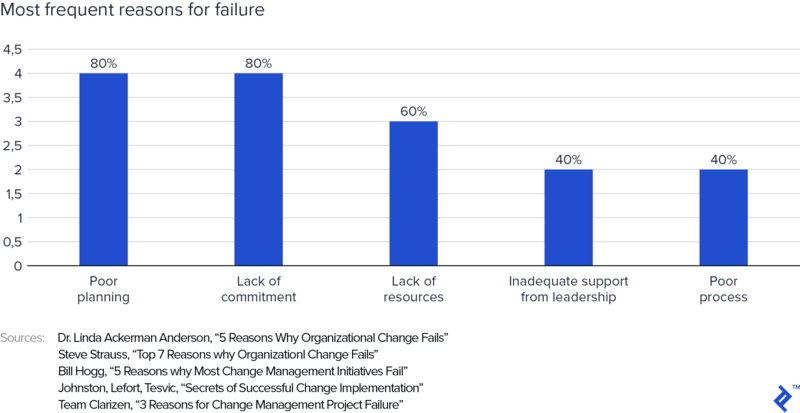 Why do change management projects fail? There is a vast body of literature on the subject of change management. I took five recent articles and studies and listed the most commonly cited reasons for failure. Poor planning and lack of commitment are mentioned in 80% of the articles as a major source of failure. It also appears that many reasons for failure are related. For example, poor planning or inadequate support from leadership automatically results in poor process. My view is that there is a more general and overarching reason for why most of these initiatives fail: poor leadership. What usually holds these processes back is that the company is simply not ready for change. Before initiating any change management project, it is imperative to create a solid and successful foundation. Change is a multi-step process, so a structured approach is essential. In my view, the three main elements are: building a compelling business case, planning accordingly, and communicating effectively. The change management project team should not just consist of people from the leadership team. On the contrary, people from the across the organization should be involved. Traditional hierarchical organizational structures of companies are not designed to handle change effectively. Build change into the culture of your organization. The most successful companies today are those that can adapt and evolve successfully. All companies, big or small, at some point in their lives face periods in which significant change is necessary. Either due to shifting consumer preferences, or the entry of new competitors, or the impact of regulation, change is always required and often can be the defining moment in the lifecycle of a business. But if change has been a constant throughout business history, one could argue that it is ever more so today, given the rapid and accelerating pace of technological progress. 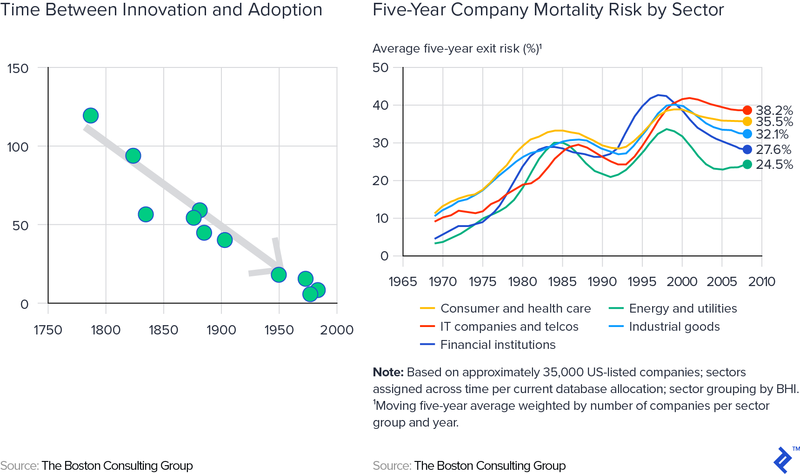 The time between innovation and adoption has shortened tremendously (chart below on the left), putting significant pressure on legacy businesses and in turn markedly shortening their average lifespans (chart below on the right). If ever there was a time for businesses to focus on change management, defined as “[the] collective term for all approaches to prepare and support individuals, teams, and organizations in making organizational change,” that time is now. But change is hard. A recent article by the Harvard Business Review claimed that about 75% of change efforts fail to deliver the expected results. A study by McKinsey shows similar failure rates (70%). The Boston Consulting Group cites self-reported CEO data that indicates “that 50% of change programs fail to achieve their objectives; the failure rate rises to 75% for more complex and ambitious programs,” and that “these rates have remained much the same for the past few decades.” IBM instead claims that only 20% of change efforts are successful. I have seen this dilemma—on the one hand, the importance and necessity of change, and on the other the difficulty in executing it effectively—firsthand. With over 20 years of experience in the finance functions of corporations across a range of industries, and in particular with a decade of experience as a CFO, I have had to confront the challenges of change time and time again. Sometimes these change processes were successful and helped propel the organizations to new heights. But many times they were not, leading to stagnation and frustration. The purpose of this article is therefore simple: to share with readers some of my hard-earned thoughts on why most change management efforts result in failure or substandard results, as well as some practical advice on what should be done differently in order to maximize the ROI of these efforts. If we are to discuss how to effectively implement change management projects, perhaps the starting point should be a review of why most change management projects fail. I’m going to review both the literature on the subject (which is fairly extensive) and my own experience and viewpoints. A review of the literature on change management reveals relatively strong alignment on the reasons for failure. The most famous contribution to the topic comes from John P. Kotter, who in 1996 published one of the seminal books on the subject. The 8 biggest mistakes identified by John P. Kotter are as summarized in the graphic below. But digging further, in an attempt to create a more exhaustive summary of the literature, I took five recent articles and studies and listed the most commonly cited reasons for failure. The results are interesting (see chart below). Looking at the data, poor planning and lack of commitment are mentioned in 80% of the articles as a major source of failure. It also appears that many reasons for failure are related. For example, poor planning or inadequate support from leadership automatically results in poor process. During my career, I have been involved in multiple change initiatives. And while I agree with the various issues outlined in the literature, my view is that there is a more general and overarching reason for why most of these initiatives fail: poor leadership. More often than not, change management projects are well defined, have clear and measurable milestones, and have a realistic implementation schedule. But what usually holds these processes back is a more fundamental issue: The company is simply not ready for change. Company leaders fail to create a culture, a narrative, and an understanding within the company for change, meaning that, despite all the well-intentioned plans and milestones, the organization doesn’t absorb change, and the whole process therefore fails. The clearest example of the above from my career relates to an SAP implementation project I was involved in. We originally thought the hardest part was going to be the technical implementation itself, but we were wrong. By far the hardest thing to confront was having to change procedures and the way people were used to working. At a senior management level, a change process was also initiated, with the support of an external change consultant. However, fairly early on, we realized that the organization lacked a clear and common vision. As previous attempts to implement change had failed, we decided to stop the project altogether, despite the significant efforts already made, and go back to the drawing board. Our first point of order was to focus our efforts on creating a culture and a work environment that would be ready for change. 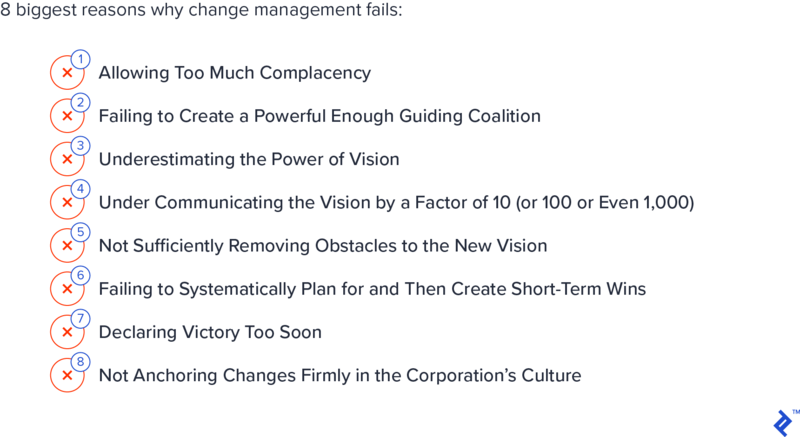 The example above illustrates how most of the reasons why change initiatives fail really boils down to a more general underlying issue among the leadership. In fact, the data supports this conclusion. The results of my study above show that two-thirds of the time, the responsibility for failure can be attributed to leadership itself, as opposed to the specific change management project in question. If leadership is not well prepared for change, any change management project group will almost certainly fail, regardless of all the management methodologies or tools which will have been used. N.B. One has to distinguish between general business leadership and change leadership. Business leadership is responsible for setting a clear vision and for managing the organization in terms of the right resources and people, whereas change leadership is responsible for the change process in terms of goals, process planning, and execution. In my view, change leadership should represent an organization more broadly than the business leadership team. As an example, people with daily and direct customer contact will know exactly how customers perceive the company. On the other hand, a CEO of a company usually receives filtered and biased feedback. Another common reason for failed change projects which I’ve witnessed relates to what this article refers to as change battle fatigue. Simply put, the more change projects are undertaken, the harder it gets. This is particularly true if previous change projects were unsuccessful—employees will become increasingly skeptical and be less open and willing to engage in the necessary sacrifices for the change project to succeed. With all the above in mind, below are my suggestions on how to ensure change initiatives are successful. In my opinion, change management should be done based on a business case. At the end of the day, change needs to lead to results (as should always be the case with any management strategy). It should benefit the overall operating model. When risks are present, financial modeling needs to be part of the process. It won’t be the easiest model to create, and there will be many scenarios and assumptions, but it will give essential information. Based on my experience, one of the most important things to do is to start with an inventory of where your organization stands in terms of vision and alignment. This can give painful conclusions but is essential. In my opinion, you should have at least 15-20% of your employees in group A, 50-60% in group B and not more than 20% in group C. Effectively managing employees in the different categories will help to get as many as possible on board. There will always be employees who are resistant to change. It is tempting to focus one’s attention on this group, but this process takes considerable time and energy. I’ve had much more success focusing instead on groups A and B. Once group C sees that employees are engaged with the change, a portion of them will follow. N.B. Given the above, HR should play a key role in any change management project. The human factor is one of biggest reasons for failed change projects. Change means risks, and it is, therefore, part of human nature to dislike change. It is therefore, critical that management effectively communicate the need for change. Communication can’t be limited to a one-time email or town hall meeting. It will take time before the message is effectively absorbed by all employees. And as mentioned, change is a multi-step process and communication will, therefore, be needed throughout the entire project. Change should also not be sugarcoated. While it may be sometimes unpleasant to communicate, it is fundamental to be clear and transparent. Be clear about the fact that change is coming and why. Finally, don’t ignore previously failed change processes and clearly outline why this change is important and why and how it will work. One important reason for failure which in my opinion is often undervalued relates to creating the right team to lead any change efforts. The change management project team should not just consist of people from the leadership team. On the contrary; people from across the organization should be involved. Traditional hierarchical organizational structures of companies are not designed to handle change effectively. John Kotter, mentioned earlier as the author of perhaps the seminal work on the topic of change management, outlines how a second organizational structure besides the existing hierarchical one is the correct approach to take—a view which I am totally aligned with. This is the only way to ensure that all information that is needed is rendered visible. The sales employee who is in daily contact with the customer, the marketing department who has insights on the appropriate consumer/market trends, the tech team to give their view of new technological developments, and finance to provide the numbers. The biggest challenge with this approach is that you have to bring together your best employees from every discipline in kind of a project management structure, which in turn often creates resource constraints. Unfortunately, this is an inevitable challenge, but one that is more than compensated by the importance of the change project. Outside resources can also be a good contribution toward a successful change process. Given the failure rate, putting theory into practice is often the bottleneck; therefore, it can be useful to use the expertise of outside resources who have been working in other industries or have undergone a successful change trajectory. Does an outsider see your company as you do? That is a very interesting question and will give valuable insights. Finally, build change into the culture of your organization. The most successful companies today are those that can adapt and evolve successfully. But with the failure rates in mind, the costs are therefore immense. Besides the out-of-pocket costs as well as time spent, the impact on the business of a failed change management process is huge. There are countless examples of companies who are either completely out of business or have lost their once-dominant market positions. Just think of Blockbuster, Blackberry, or Nokia. And finally, although more challenging to quantify, the motivational aspect of a failed change management initiative cannot be ignored—staff will be demoralized, leading to lower productivity or even higher turnover rates. The time is therefore ripe for organizations all over the world to put effort and thought into change management. With a well-planned and effectively executed approach, companies can ensure they don’t fall by the wayside and confront the incoming tide of technological disruption head-on. What do you mean by change management? Change management is the discipline related to preparing companies for, and implementing, important organizational changes. What are the essential elements of change management? Before initiating any change management project, it is imperative to create a solid, and successful foundation. Change is a multi-step process, so a structured approach is essential. The three main elements are: building a compelling business case, planning accordingly, and communicating effectively. What are the benefits of change management? Due to the increasing pace of technological progress, the time between innovation and adoption has shortened tremendously, putting significant pressure on legacy businesses and in turn markedly shortening their average lifespans. Change management ensures companies can survive and thrive.